What if Global Forgiveness went viral!?!? FC from Forgiveness Challenge on Vimeo. The U.N. International Peace Day. As I gathered with at least one Rabbi, an Imam, Pastors, and persons from various international locations, including local Native American Indians, I wished for more times when more persons of diverse traditions could be together. Conflict is all around us. It is not something that we can choose to have or not have. It just is. It may center on something as seemingly trivial as who leaves their dirty cups in the sink, where to go eat lunch, or whether or not to buy that new piece of stereo equipment. Or it may be more complex, such as whether we should invest in stock or bonds, or what college your child should attend to get the best education. This course is not about avoiding conflict. Avoiding it is not only impossible but undesirable. This course is about discovering productive ways of handling conflict, ways that make a difference in all areas of our lives. Difference of opinion or perspective; such as between a mechanic and inspector. We have all had the experiences of handling conflict both constructively and destructively. The outcomes of conflicts handled constructively are so much more attractive that it is hard to imagine we would settle for less. There are several stages we can go through before we reach the level of conflict. Perhaps nothing is said as yet, however things don’t feel right. It maybe difficult at this stage to identify what the problem is. A short sharp exchange may occur without any lasting internal reaction. Something may have occurred between you and someone else that has left you upset, irritated or with a result you did not want. The details of a situation may be unclear. The motive or intent of a situation not fully understood by the parties involved. You may start feeling anxious about your relationship with the other person. Maybe you are at the point where just one more nudge will “push you over the edge”, ready to give them a “piece of your mind”. This level may build to the point where each interaction with this person confirms your negative attitude towards them. The relationship may become a cause for constant worry and concern. Behavior is affected and normal functioning starts to become difficult. No longer talking to the other individual. Or conversely, screaming at one another. Quitting your job or worse yet be dismissed. Throw china, or whatever else is close at hand. As you can see we want to avoid ever getting to the “crisis” stage. We should always be on the look out for clues at the discomfort and incident level. 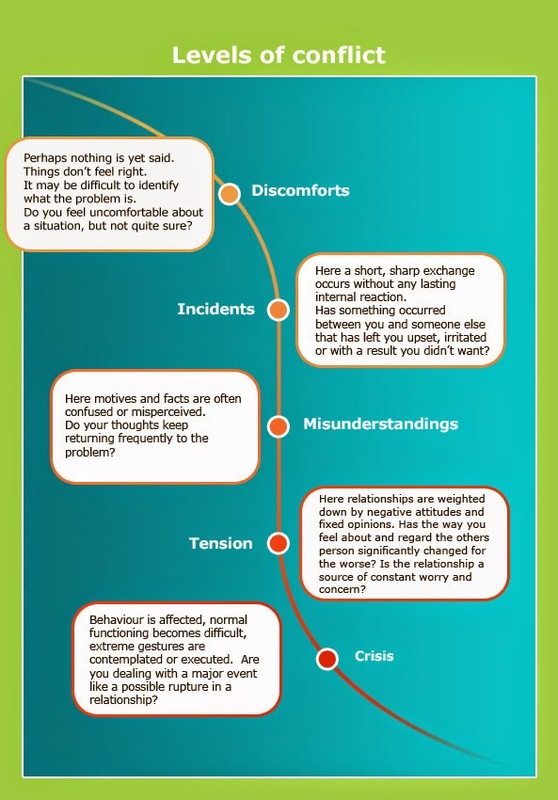 Dealing with conflict at these levels is much easier than at crisis stage, where emotions are running high. By working on solving the issue at the discomfort level we have a greater chance of achieving a constructive rather than destructive outcome. 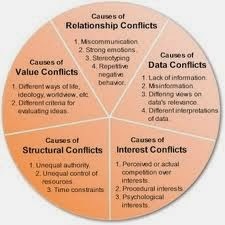 Discovered what conflict is and learned the various levels at which it develops. Learned to look for the early clues to conflict, and to stay alert and be ready to act, if and when appropriate. One should greet conflict in a positive way, ready to learn something new or improve on relationships. Credit This course was created by AMFA Local 11 to assist in the education of its Professional Standards Committee members. Permission to use this material is granted to any AMFA Local. This course was created using materials provided by The Conflict Resolution Network. Permission has been extended to use this material providing credit remains intact on all modules. I learned more about Michelle LeBaron today. She has insightful ideas about the need to understand the depth of cultural issues that shape conflicts among persons. I could share more, but these links provide great summary details for your learning. 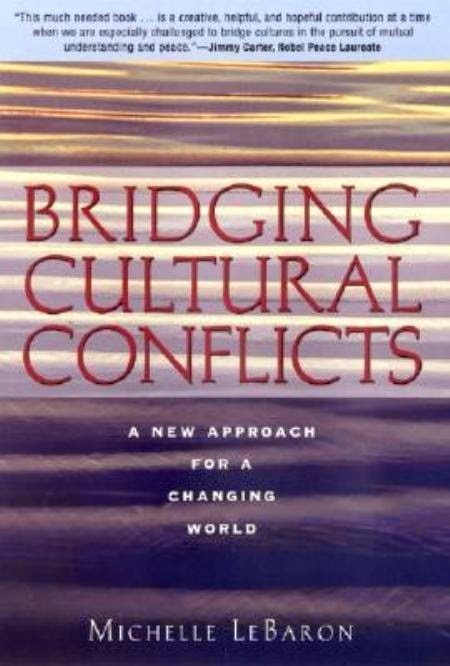 Summary of Bridging Cultural Conflicts: A New Approach for a Changing World with summary written by Brett Reeder, Conflict Research Consortium - Citation: LeBaron, Michelle, 2003,Bridging Cultural Conflicts: A New Approach for a Changing World, Jossey-Bass, San Francisco, CA. When people are engaged in projects, there is potential for conflict. The United Methodist Church has been working to insure that congregations are places of peace, even while they recognize that conflict may take place within congregations. Toward that end, JustPeaceUMC.org reflects the intentional efforts of the United Methodist Church to provide resources and tools for faith communities toward the transformation of conflict to peace. Great resource links at the JustPeaceUMC blog and at the JustPeaceUMC resources page! Learning more about Elise Boulding in these days - and my life is better as a result. More here on Elise. Leonard Fein has pointed out that the number one power in peacemaking is the power to convene. More works by Leonard Fein here. I've been thinking recently about the term "practitioner." The term is used for persons who have developed an expertise, as for Medical Doctors who are Medical practitioners. And yet, the term is also used among Eastern Religions/Culture for persons who engage in certain practices as a routine in their life, for example, persons who are practitioners of yoga. We don't commonly use the term "practitioner" for persons who are practicing for a sport (baseball, football, basketball, tennis, etc), though it is certainly true that persons practice the sport in order to develop their skill to perform on the playing field/court. This week I'm spending some time with Rick Love and getting to know Peace Catalyst International while I'm at DUKE University's Center for Reconciliation. For many years now I've used the label for myself as a Peacemaker. I like the term and think it is important for many reasons. We work to make peace. I wonder, though, if the label of Peace Practitioner would be more helpful as we move to the future. Our goal, after all, is to regularly practice peace. And, as we practice the habits, and conversation, and lifestyle of practicing peace, we develop our skills, we reshape the routines of our lives, and we develop the expertise of bringing peace in our world. The Interfaith Alliance Foundation of Oklahoma will hold its 11th Annual Day of Reflection on Thursday, May 1, at 7:00 pm at the First Christian Church, 3700 N. Walker, OKC. The event coincides with the National Day of Prayer. The Interfaith event stresses the constructive contributions to society of diverse religious traditions in Oklahoma and America. This year's theme will be "Violence in Society: A Matter of Faith." "Too often, violence in the name of religion is common place, so we want to stress violence prevention in the name of religion," said Rev Jeff Hamilton, Legislative Chair of the Interfaith Alliance Foundation of Oklahoma. The keynote speaker for the event will be Janet L Peery, CEO, YWCA, Oklahoma City. Peery is well known for her leadership for the prevention of domestic violence and sexual assault. Jan's advocacy work has brought her numerous recognitions and awards, including the Federal Bureau of Investigation's Director's 2013 Community Leadership Award and most recently, the "Advocacy Award" by the Oklahoma Conference of Churches. The Rev Jesse Jackson, pastor of the East Sixth Street Christian Church (Disciples of Christ) OKC will offer a "Pastoral Reflection" on the theme of violence in society. A graduate of Phillips Theological Seminary, Jackson has served as Program Director for the Eastside YMCA and a teacher at the Marcus Garvey Leadership Charter School. What will you create to make the world more awesome? Wherever you are in the world today . . . give the world reason to dance. The most recent rampage in a school, this time with common steak knives, should cause us to reflect on the fact that "guns" are not the problem. The weapon of violence is not the sole problem, the culture of violence and hatred is at the fore. Thinking about the stabbing today in Pittsburgh and the many other school shootings. Many ask why does this happen. Why do kids snap? It is absolutely sad to me how we treat one another especially those who are different than us. I understand worrying that our kids are being bullied. I do. I worry about that too. But I think we also need to worry about whether our kids are the bully. And what I'm finding as I watch teens and listen to them is that far more often than we'd like to think, kids learn to be bullies at home. How we talk to our kids matter. I was at a baseball game today and the opposing team was constantly mocking the pitcher. And right there beside them were adults not only allowing such behavior and thus approving but no doubt are mockers themselves. Adults/parents, if we don't like how the young people of the world act, we need to check ourselves and ask what are they seeing and learning from us, the adults. What message do we give them? Do they see others as people to love and accept no matter what OR do they see others simply as objects to mock? How do we see others? What our kids learn is far more caught than taught. Our kids listen and watch. It matters little what we say. It matters more what we do. Foster care for children in America is a very complex set of existential, familial, juridicial, and government social issues. This powerful video creates in detail much of the horrendous reality that foster children face, realistic to many stories I've witnessed. The narration itself is powerful. Even the title, itself, tells the sad story. Be aware and beware(! ), I cried for 8 of the 12 minutes. I hope this moves you to tears - and to determined actions in some new way - to be invested to work toward the good for the all! ReMoved from HESCHLE on Vimeo. This is not just a great video about Dutch cycling - it's also about eupan. Because of the advocacy work of reasonable people seeking alternatives to death and economic issues, decision makers and planners found safer, healthier ways for people to live together. This historical review models not only good ways to foster urban development, but good ways to move forward into a better future for human shared reciprocity. This annual event exists to encourage every person in Oklahoma City to make tangible and long-lasting changes in their lives that positively impact women. We are committed to offering the information and education we all need to understand how to serve women locally and globally. We believe the Church of Oklahoma City can lead the way in caring for the marginalized. The Greatest Revoution begins within. Restorative Justice works! Changing people, fixing schools! Through the Eupan Global Initiative we are privileged to participate in many great initiatives & advocacy programs toward the good for the all! Great partner work with the Peace Alliance demonstrates that we can train school children & teens to act in better ways! I wish every educator would view & share this 7 minute video with their colleagues & educational administration! Thoughts, words, behavior, habits, values and life. Keep your thoughts positive because your thoughts become your words. Keep your behavior positive because your behavior become your habits. Keep your habits positive because your habits become your values. Keep your values positive because your values become your destiny. May our thoughts be toward peace, generosity, kindness, respect, mutuality, and love. I've had great educational & existential experiences at DUKE. I know many former students who feel the same about their program of studies at DUKE. The themes & rates of this conference are, in my opinion, great! Duke Summer Institute from Center for Reconciliation on Vimeo. 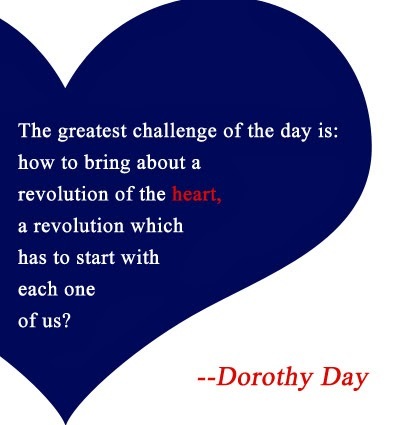 What is your peacemaking resolution for 2014? I will be in Palestine, Jordan, and Israel in a few hours. Peace for this region of the world - and for our World - is on my mind. Here are Christian reflections from Shalomhouse.us for reflection in 2014. Jesus is calling us to be Peacemakers, therefore Shalom House is asking you to think about how you can be a peacemaker this year. . . . Shalom in its fullest definition is wholeness, delight, the way things are supposed to be. New Year’s resolutions are often about action and growth. What will you do this year to bring shalom to your community, your city, and the world? How do you want to grow as a peacemaker this year?